Not long after Maddie died, my friend Meghan rallied dozens of people to go in on a necklace of Maddie’s silhouette. I was speechless when she presented it to me – and blown away when she also presented one to my mom. The kindness and generosity that was shown to my family after Maddie’s death still knocks me over. I very rarely take off the necklace. My fingers go to it several times a day without me even realizing. It gives me comfort and consistency. Before Jackie’s first brain surgery, I gave her a shirt of Maddie’s that said, “I’m Brave.” After her surgery, her sister texted me a picture of Jackie with the shirt. 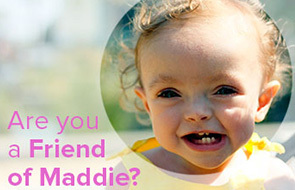 On Maddie’s first birthday a few months later, Jackie returned the shirt and gave Maddie a special necklace: a small gold disc with “I’m Brave” engraved on the front, and “<3 jno” on the back. It made me cry and I told Jackie that Maddie would wear it on the days when she needed extra-bravery, like getting a vaccine or her first day of kindergarten. I now wear that charm on the same chain as my Maddie silhouette. Annie loves the two charms, and if either of them are flipped or twisted on the chain, she’ll have me bend down so she can fix them. She’ll often say, “Can I see Maddie?” or “That’s my big sister Maddie!” I really, really wanted to get a silhouette of Annie (I even had a perfect picture of her at 16 months old, like Maddie’s silhouette) but the place that made the necklace Meghan ordered for me no longer made them. I searched off and on for a new company to make one for two years. I found plenty that offered something close, but it was too big, or too small, or different in style, and I wanted the charms to be as similar as possible so that the profiles themselves would be what distinguished the two silhouettes. I finally found the perfect place a few weeks before Christmas, but I fretted because it wasn’t cheap and I didn’t want so much money spent on me. But Mike insisted, saying it was more than a piece of jewelry – it was making sure that my other special girl took her rightful place on my special chain. I put it on my chain, and went to show Annabel. She was beaming. She loves it. I love it, too. edit: The company that made Annie’s necklace is Love & Victory. This post isn’t sponsored, we bought the charm ourselves! So many of your posts make me laugh, and some of course, make me sad, but mostly your posts make me appreciate so much about my own life. I’m not usually a cheesy type of person, and prefer my own dry humour (it’s a British thing, and I spelled humour the British way), but this particular post made me cry. My tears were both sad and happy. I feel compelled to say this …. Heather, I think YOU are one of the bravest people I’ve ever known. I have to say – that is about the sweetest thing I have heard in days. I love her response. They are beautiful. Thank you for sharing this with us. Annie is too sweet. That’s so sweet!!! They REALLY captured both girls!!! I also LOVE the “I’m Brave”!!! What a BEAUTIFUL gift for Jackie to give to Maddie. In a few months you’ll have to add the little Prince to the mix. Thanks for sharing your treasures…..I love them. Wow Heather! What a beautiful and SPECIAL piece of jewelry! And a fantastic way to always keep your girls close to your heart (not like they’re ever far from it though!). Very cool! Annie always says the most dear things! What a special post about a special family. What a beautiful way to hold the girls close to your heart! Would you mind sharing the company you had Annie’s made at. Wow that is wonderful! They look exactly like the girls. Oh Heather, I love it too! Priceless!! Love. So glad you were able to find one for Annie too. This is beautiful. I can see why Annie loves the charms. I love the charms! can you share where you bought Annie’s from? http://love-and-victory.com/ is the name of the company. GORGEOUS! I have a friend that just lost her 5-year-old daughter at the beginning of December after an August car accident, that she was behind the wheel. Tragic. I would love to have one of these made for her since she is struggling beyond any words that I can put together. Are you willing to disclose the name of the company/website that made it? of course! It’s from http://love-and-victory.com/. My heart goes out to your friend, please give her my love. Beautiful girls, beautiful charms. And Annie’s words brought tears to my eyes. Thanks for sharing this with us. beautiful- please share the website! I feel the same way about my NO TURK necklace (I heart JNO) that I got from Melissa back in 2008. It’s beautiful Heather. Most definitely sisters. You can see it in those cute button noses! You do an incredible job of honoring and loving both your girls, uniquely and yet in the same special ways. I can’t imagine it is an easy dance, Heather, but you and Mike do it so well. So sweet!! Love them. So beautiful, and such a wonderful way to honor your girls. So cute that Annie was super excited. So, so beautiful, Heather! It’s just perfect! This makes me smile. What a beautiful way to have your girls close to you. That necklace is fabulous. I’m imagining the joy it brings Annie to see herself up there with her big sister. Perfect. So beautiful. It’s a really creative way to honor your children. Much better than a birthstone ring or something like that. So beautiful ~ I love it! Okay…so the only bummer thing about having so many kids…I can never get a necklace like that! Can you just imagine ten heads going across my neck? It would look…weird. That was so touching. Annie is such a little darling. Are you please let me know where you got the “AM” charms? They are nice! Love all the charms! So thoughtful of Meghan and Jackie! I have a necklace with a charm for each of our children’s initials. I never take it off either and you said it perfectly – it gives me comfort as well. So glad you found the Annie charm. Perfection! I love Annie’s reaction to seeing her sweet profile…you do such a great job honoring and respecting both your girls! A perfect match. What a wonderful way to keep both your beautiful daughters close to your heart! These are absolutely gorgeous! I have a charm bracelet with generic boy and girl heads, but perhaps it’s time to upgrade! Thank you so much for posting this! I love the silhouettes and charm. I was the one pestering you on Instagram, only to figure out you had posted an earlier photo in your stream (DUH ME)! they are so beautiful! can’t wait to see your next silhouette. Both profiles are beautiful…and I love the stories behind each of them. How special for Annie to be carried close to your heart on the same chain as her big sister Maddie…an obvious physical reminder of what she already knows emotionally: how very much both the Spohr sisters are loved! And one day a third profile will join the girls~their baby brother.